Ivan R. recently sent me an e-mail about the MOTHER series logo, namely the planet that’s used in the “O” n the name. 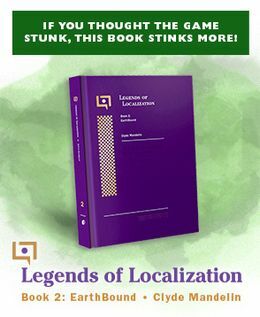 I had totally forgotten about it, this is exactly the kind of thing I made EarthBound Central for! So without further ado, here’s where the MOTHER planet logo thing comes from. Anyway, now whenever you see the logo, you can thank NASA! Oh, I thought this was pretty common knowledge, but maybe I’m just weird. The Blue Marble picture was originally taken upside-down because of the position of Apollo 17 at the time. So maybe that’s why it’s upside down in the MOTHER logo. 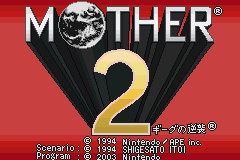 It’s especially interesting to note that the final time the MOTHER logo is displayed in MOTHER 3, the Blue Marble image is right-side up. I always thought that signified the renewal of the world to its proper state. Fun fact: The Apollo 17 astronauts actually took the picture “upside-down” (if there was such a thing in space) because that’s how they were oriented at the time. NASA or someone must’ve rotated the picture 180 degrees since we perceive north as up and south as down. Is it just me or does it kinda look like one of Giygas’ final forms when it’s in black and white? Wow. Had no idea about that. Awesome. In the world of EarthBound, the world has gone upside down. MY GOD, that is quite impressive. However, I hadn’t noticed that the logo was right side up at the end of Mother 3. Thanks for that. You learn something new every day. Of course, we can get Einsteinian here and say the world has no *correct* orientation because in space, there is no up or down. Slightly relevant anecdote: During my senior year in high school, one of my classrooms had a world map that was “upside-down” with all the text correctly displayed at that orientation — supposedly to try and get you to break away from the rigid understanding of how the world is shaped. A really cool idea actually, even though it had no impact because we never used that map 😐 I guess the world does need standards. ~C’est la vie. I never really thought of where the logo came from. But now that you look at it, it is very similar. Man, I love the uncommon knowledge posts! Especially because people here are so cool and knowledgable and add MORE fun facts to it! Now I have to beat Mother 3 again to check the logo… good thing the Group Gameplay thing is coming up soon. Hmm… what about the logo for the original Mother, though? You can kinda see the same image, but it’s animated and looks more like a generic Earth picture. I dunno, what do you think? @SmaMan: That’s more of an issue of graphical limitations. 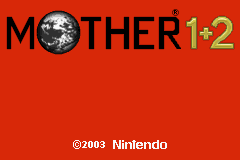 The MOTHER 1 logo actually has the best image of the Blue Marble out of any of the other titles in my opinion – just look for an image of its box art. Fun fact: Final Fantasy Dissidia uses the same Earth image, if you play on the FF4 moon level and look up in the sky. It made me do a double-take when I saw it and instantly thought of Mother. You know, Mato, what I really like about you and this site is that even when Earthbound is at a low point, you still find interesting things to talk about it, like this. Keep it up! And this is why I sometimes refer to the game as Mother Earth. Honestly, Mother doesn’t make much sense to me anyways. Heh, I’ve actually been aware of this for a while, and assumed it was common knowledge. 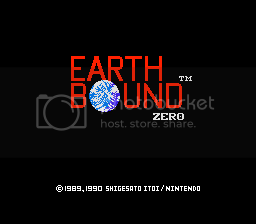 Around a month ago I actually did an essay analysing the EarthBound series for my media class – and I scored best in the class for the semester too -, so for a cover page for the folder I prepared a greyscaled Blue Marble in Photoshop. Not sure where I was going with this little segue, but yeah. I knew the logo was from the Blue Marble picture, but I never really saw any similarities between them until now. How did anyone NOT notice this? wait….then what is the “O” in Mother 3 then? is it just a gray marble? So then food for thought, Is Moonside a representation of our world? Since the world on the cover of Mother 2 was ‘upside down’ our world is ‘right-side up’ and Moonside is the opposite of Fourside……Man, I could make up a theory for this. @blahblah: The O in Mother 3 represents the Earth as covered in metal, as Mother 3 is nature being turned into machines and chimeras and about a simple town in tune with nature rapidly changing into a soulless metal city. The logo shows a combination of wood and metal. BTW Mato, I hope you see this. I recently finished my 8th play through of Mother 3. Just wanted to say thanks again for all the work you put into it. And I’m Randomizer form starmen.net forums. And in fact, someone told me that someone posted this up here and i told him that it was me, and he was :0. XD. And this happned on Roblox. Im sonicvsmaio4, BTW. And OMG, that mean’s I’m famous in Japan, XD. I knew the logo was of Earth,I just never knew it was rotated. I always thought the Earth in the MOTHER logo looked like the Blue marble, and now I know why.